Tennessee Tornadoes: Whence cometh the wind? My experience with tornadoes is nil, while Larry Whitney as the owner of the Pebble Mtn Campground, knows his responsibility to offer shelter from the approaching storm, as he is able. The four of us move quickly to the shelter of the concrete block store room inside the camp pavilion, Larry Whitney, Marie his wife, myself and another camper also named Larry. Minna, my shih tzu, is in my arms; Maria has their schnauzer, Charlie, on a leash; and Larry the camper has his little dog, whose name I never quite learned, reluctantly responding to word commands. Luckily there are only the four of us in the campground. The wind is blowing, shifting strangely about as it whistles through the rafters above us in the dark, one bulb room. We search for candles. A comment is made that the roof might blow off but the block walls offer some protection. Why doesn’t that damn tornado stay in Oklahoma where it belongs? Tennessee is not accustomed to such calamities. Rain begins in earnest pounding the rooftop; turning to hail: sounding to all like stones being thrown from above, peppering the night with great force. The tornado passes through with a roar heard above the peppering hail, rain and wind. Not sounding like a train as expected but more like a huge, long gust you might hear in a blizzard: roaring but muffled in some way. A great thud is heard and the bulb goes out. This is accompanied by a flash from the pavilion main room overhead lights which go off, then on, then off again in a slow retreat. The westerly facing windows in the pavilion rattle loudly as if being pushed by a giant air pocket or gust. We close completely the ajar storeroom door, waiting inside for whatever God has sent us to face. Outside the wind spins all manner of loose objects in its path dropping some from afar on us, taking some of ours to others down the way. The quiet after the storm happens quite quickly. We go outside finding trees down, power lines strewn all about, broken picnic tables and camper items and furniture strewn here to there among branches and bushes torn from trees and the ground by swirling winds. We see a large tree has fallen on the rooftop of the pavilion itself. Another has fallen between Larry and Maria’s office/home and the garage. There are no lights so we really see very little. I return to the safety of the pavilion and sit with Minna, our flashlight playing through the rafters onto the dark plywood of the gabled roof interior, waiting for the next round. After a while, when no one returns to join us, Minna and I return to our camper, lying down to sleep, thinking the storm is over. With no power or internet we can’t know that the tornado watch remains active. At 1:30 a.m. the wind increases and I am awakened briefly but fall back to sleep. Suddenly I am forced from my bed by the rocking of the trailer. Falling to the camper floor, I am not sure if I had been thrown or frightened there. I reach back up taking hold of Minna pulling her down and under me as the camper rocks—I am on hands and knees, trying to rise but I am tossed back and forth as if in a boat caught in an overwhelming wake. My arms bash the counter cabinets, then the opposite refrigerator. I cannot stand, I cannot stay on my painful knees. My left shoulder is bashed against the cabinets causing pain like a blow to the elbow funny bone. The turbulence is punctuated by crashing trees and high winds roaring in opposing waves. The trailer waddles around and I feel quite sure we are about to take to the air or be struck dead by a falling tree as the storm reaches its height. Our shades are drawn, we can only hear the raging wind outside. My truck buried, Luciee miraculously untouched. camper down the way appears as a sinking ship with the stern high in the air as the bow is crushed by a huge fallen poplar. Fortunately, no one was there to be injured. Larry, the camper, stands nearby calling to his dog. The owners, Larry and Maria, are wandering about surveying the unbelievable damage as fallen trees are everywhere. Larry discovers that moving his truck from the house carport to the safety of the pavilion driveway was a useless attempt as a tree lays across his hood. The second tornado has picked up the tree that had fallen between their house and garage in the first tornado and dropped it on the carport crushing the roof on their PT Cruiser. Unhappily I observe that my truck, my lovely truck—has been squashed by a huge poplar. Reluctantly and somewhat fearfully, we return to our beds at 3:30 a.m. The air is still warm and humid indicating that all may not be over. A cool breeze blows through and we hope that the cold front has arrived. Very tired, and feeling the waves of shock and emotion that accompany such large amounts of adrenaline in our systems, I can’t sleep, but eventually nap until early morning light. Getting up, I make tea and survey the damage through the camper windows. Soon EMS trucks, flashing their lights are on the main road and chain saws whir as the emergency crews carve their way up the campground road to us. “Are you hurt?” they ask. “No one here is injured,” we reply. Huge piles of branches burned through the nights. The driveway is a maze of fallen trees and power lines. We spend the day cleaning up, dragging fallen branches to huge piles. Volunteers begin to appear with chain saws and heavy equipment. I don’t know who people are as I am only passing through but many were neighbors, some were friends and some were Mennonites I am told from as far away as Maryland come to help their stricken neighbors. Red Cross and other agencies bring food, water and supplies as the cleanup crews toil. Attending to my truck, I see that a branch has punctured one of the tires but I am actually able to change the flat with the help of some passing young men, afterward we spend several hours cutting up the tree that lay across her. The truck is mechanically still drivable but body damage exists in every quarter. The cab is crushed down, the camper shell destroyed, hail damage and crushed fenders, broken windows and severely cracked windshield. A TOTAL LOSS. But all things considered, one must thank the powers that be for the miracle that Miss Minna, and I and Miss Luciee our little trailer survived the wrath of nature’s wind. The next few days are a blur. Taking care of personal insurance business, as well as helping with the clean up. Larry and Maria are stoic, going about their tasks with resolve and courage. The second, third and fourth days, Larry labors from early morning ’til dark clearing, managing his business and sharing the adventure with countless official visitors, firemen, senators, police and so many others. Each day his shoulders seem to bear a heavier load. Whitney friends gather for dinner at the McNeely home. 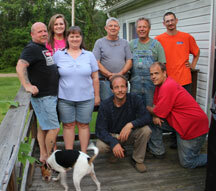 On Sunday night Bobbie and Keith McNeely made dinner for the local crew at their home. They are friends of the owners, the McNeelys have come to help and are part of the key group of people who give freely of their time to help Pebble Mountain back to its feet. It is an honor to have been invited to break bread with such an extraordinary group of people. 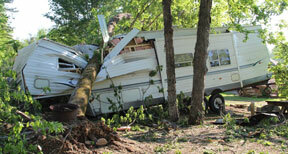 The people in homes and villages surrounding Pebble Mountain Campground also suffered greatly. Many having lost their lives or family members to the storm. Animals have disappeared or been traumatized. All sorts of stories have been told but in fact I have been cut off from news, TV, Internet for several days and therefore have little firsthand knowledge about the heavy losses suffered except for the remarkable journeys the people of Pebble Mountain Campground lived these last few days. I’m grateful you (and Minna) are not seriously injured. What an experience for you to have on your journey; discovering not only what affects us from outside of ourselves but how we, as humans, share related common experiences inside our selves. Thank you for your first hand account from the front lines of this important history. Please take care of yourself so you may, one day, return and tell the stories to those of us awaiting the opportunity to listen. Thank God he was with us in this time of need. We all could have been killed. The worst was the second time around, we had no way of knowing this one was coming! Thanks Bill for your sharp recollection of the events. We hope all your further journeys will be pleasant ones. Bill- Just had a chance to read your account. WHEW. I am so glad that you all are okay. I had never thought about being hit by TWO tornadoes–and once the power was down, not being able to keep in touch with news to learn if another was on the way—just like in the old days I guess- before weathermen, etc. Take care and Safe Travels. It is always shocking to see first-hand what Mother Nature is capable of doing. Twisted tree trunks like pretzels, of a herd of 50 cows only 13 are found, entire trailers swooped up and carried half a mile into the forest, brick houses leveled. I now understand the fear in the eyes of my dog Casey who, home alone, during the 89 earthquake was downstairs when the upstairs open landing bookcase dumped its contents (including shelves) down the stairs to the first floor. Truly the sky was falling. This is but one of the adventures ahead for RemarkableJourneys as we leave Thursday for Alaska.